These images have been archived using Disk Copy Pro 2.6 (DCP) IMG format, which is a DOS based utility which can also be extracted by WinImage. Each image is saved in 3 1/2" 1.44MB HD Format, But can be easily be converted into 360Kb 5 1/4" LD, 1.2Mb 5 1/4" HD and 3 1/2" 720Kb LD Formats by both DCP and WinImage. Bootdisks for versions of MS PC & DR DOS and DOS based Bootdisks for Windows up to and including ME are listed here. Disk Conversion is disabled in this shareware copy, But it isable to read and write 1.68MB DMF Format. (Complete with Helpfiles and Notes) and re-create all the following DOS images in1.44MB 3�" HD Format Only. Other Image File Types and Locations. You are advised to create a Bootdisk from your own Working Computer. The following images are provided as Emergency Bootdisks (EBD) Only. Microsofts Copyrights and Limitations on use still apply. Please Note - The earlier MS-DOS 6.22 Emergency Boot Disk (EBD) has now been Withdrawn from use. MS-DOS 6.20 Bootdisk ~ WithDblspace.Bin ~ Use with msback62.exeto restore Compressed Doublespace Backup Sets. MS-DOS 6.21 Bootdisk ~ Interimversion of MS-DOS supplied with no Disk Compression software. MS-DOS 6.22 Bootdisk ~ WithDrvspace. Bin ~ Use with mback622.exeto restore Compressed Drivespace Backup Sets. Microsoft Windows 3.1/3.11 & Windows for Workgroups3.1/3.11 have no Bootdisks as MS-DOS needs to be installed first. Download MS-DOS version used or if not known ~ try the MS-DOS6.22 bootdisk first. Microsoft Windows 95 onwards have a corresponding 'Startup Diskette' which from Windows 98 onwards also includes FAT32 & CD-ROM support. But it also creates a RAM Drive which pushes the CD Drive up one letter. The following are the main release versions of Windows DOS as Basic Bootdisks, the same as the above MS-DOS Disks. See Other Bootdisks towards the bottom of the page if you want a complete 'System Bootdisk' as supplied by OEM providers. For reasons only known to themselves, Microsoft disabled the System Format function on the Windows Me Bootdisk for Floppy Disks. (As well as 'Real Mode' within Windows Me itself! - You can still Format Floppy disks, But you can only SYS a Hard Drive C:\ Partition. If you need to use a WinMe Bootdisk, Just recreate this image as often as you want. Windows XP produces a MS-DOS 8.0 (Win Me) Bootdisk, which cannot be used to access a NTFS harddrive. Devicelogics have released a new version of DR-DOS (DR-DOS 8.0) but so far it is not available for free download. MS-DOS 6.22 CD-ROM Setup Disk ~ In the same style as the later Windows 9x Bootdisks - Checks harddrive & installs CD-ROM Driver. OLDBIOS CD Bootdisk (Self-Extracting IMZ Version) ~ For older BIOS's Due to incompatibility with CD-booting technical specifications, "El Torito" standard, no-emulation method of CD Boot. Try using thisdisk. This program will create a floppy disk to work around this problem. You boot the PC from this floppy and then a small program on the floppy switches boot to a CD-ROM device . select RMPrepUSB (Make USB Bootable). 2. Under 3 Bootloader Options, select XP/BartPE bootable (NTLDR). Under 4 Filesystem and Overrides, select FAT 32. On the right, select 6 Prepare Drive. should have a bootable hiren's USB flash drive. For those of you interested in a Windows version of the Ultimate Boot CD, you might want to check out this project initiated by Ben Burrows. New! Run Ultimate Boot CD from your USB memory stick. A script on the CD prepares your USB memory stick so that it can be used on newer machines that supports booting from USB devices. You can access the same tools as you would from the CD version. CPU Burn-in 1.00 The Linux version which is included in UBCD is at V1.00. V1.01 applies to Windows only. Mersenne Prime Test 23.5.2 Need to update Mersenne Prime Test boot disk to allow user to manually override the decision (based on automatic CPU detection) to run V23/V24. The original maintainer does not have time to do this, so if you are interested to help, please contact me directly. StressCPU 24-Oct-05 V2.0 is out, but I need someone to either update Adrian's combo Linux loader (/boot/cpustres*) or send me a new one. Please email me directly if you can help. HUTIL (Samsung) 1.21/2.03 From soeren: "HUTIL 2.00 lacks the possibility to view the SMART values and it appears to be a lot slower than 1.21. It's only needed for the newest Samsung drives, the "older" ones still work with 1.21." DLG Diagnostic (Western Digital) 4.15/5.04c V5.x has been reported not to work on some older machines, so V4.15 has been included as a backup. GWSCAN (Gateway) 3.15/5.09 V5.x is for IDE hard drives larger than 10GB. For IDE hard drives 10GB or smaller, V3.15 is recommended. Active@ KillDisk Free Edition 4.1 Free Edition. Supports "One Pass Zeros" method only. PC INSPECTOR e-maxx 0.95 Actual version is 0.95 Build 775, but is referred to as 1.0 on product website. g4u 1.17 Unable to integrate latest version of g4u (does not like mkisofs -N flag, which is required for integrating Windows CD). If anyone knows of a workaround, please email me. PC INSPECTOR clone maxx 0.95 Build 769 Actual version is 0.95 Build 769, but is referred to as 1.0 on produce website. XXCOPY 2.93.1 Latest version on website says 2.95.3, but XXCOPY16.EXE still shows 2.93.1. Ranish Partition Manager 2.40 Using stable version because V2.44 is beta and reported to be buggy. Cute Partition Manager 0.9.5 Although website says 0.9.6, program version and history log both says 0.9.5. D-Browse 1.24 Must enable long filename support for it to work. Volkov Commander 4.99.08 alpha Or you can just type "vc" at the DOS prompt to launch this file manager. F-Prot Antivirus for DOS 3.16f For personal use only. Virus definition: 4 May 2007. McAfee Antivirus Scanner 4.40.0 For personal use only. Virus definition: 3 May 2007. BugHunter 2.1 Note that C:\ has to be accessible and writable, otherwise BUGHUNT.INI must be edited and the line C:\BUGHUNT.DAT changed to X:\BUGHUNT.DAT, where X is the drive letter of the RAM disk. FreeDOS Boot Disk 3.40 This is named dosubcd.igz under the images subdirectory, and is the default boot disk for most DOS programs under dosapps. You can easily make other DOS disk images your default by renaming the appropriate image file (eg. lzubcd.igz) to dosubcd.igz. OpenDOS Boot Disk 3.40 Won't work in a virtual machine, but will work on a physical machine. MS-DOS Boot Disk 3.40 By default, this is not included in UBCD due to its commercial nature. But you can easily download and place it under the images subdirectory in order to use it. NwDsk: NetWare Boot Disk 3.40 You can run TinyHost by choosing the "tinyhost" profile after booting. Then you will be able to connect remotely from any Java-capable machine with the command java -jar tinyclient.jar x.x.x.x password (password defaults to 'nwdsk'). Trinux 0.89 The latest incarnation of the Trinux project is ubuntutrinux, but a stable release does not exist yet. The full version contains all the tools found in the basic version but also adds the INSERT environment, a Linux distribution based on Knoppix. INSERT contains many utilities for the Linux user, such as the ability to mount most filesystems (including NTFS(rw) via Captive), ssh and sshfs which allows you to mount a filesystem over ssh, Samba client and server, IDS and testing tools such as Nessus and Snort, Rdesktop to remote control Windows servers, VNC, Qtparted for re-partitioning, iptables, and Monkey webserver are just a few of the tools found on the UBCD version of INSERT. In addition, UBCD Insert also supports modules which can be found at SourceForge that contain several more tools. Please see UBCD Insert documentation before burning this ISO since it contains information on modules and customization you may find useful. Emergency Boot CD Pro 0.6.1 with Diagnostics EBCD will be very useful when you need to: copy/move files (with long names, not necessary in CP437 encoding) from/to the disk but OS which can handle them (windows, linux...) cannot boot. In particular, you may create a backup copy of normally installed and configured Windows and later restore Windows from such backup copy. So, in the case of fault OS itself and all software and its settings can be restored in 5-10 minutes. perform emergency boot of Windows NT / 2000 / XP. When the loader of this OS on the hard disk is damaged or misconfigured, you are able to load OS using another, standalone loader from this CD. recover master boot record of HDD. This allows to boot OS after incorrect uninstallation of custom loader (LILO, for example), which made all OS on your PC not bootable. delete, move, copy to file (image) and re-create partition from file. Image transfer over network is also supported: so you may configure one PC and then make contents of harddisks of other PCs same as contents of the harddisk of the first one. change password of any user, including administator of Windows NT/2000/XP OS. You do not need to know the old password. recover deleted file, even file re-deleted from Windows Recycle Bin, and, in contrast, wipe single file or a whole disk so that it will be impossible to recover it in any way. recover data from accidently formatted disk. Sometimes it helps to recover data from the disk, damaged by a virus. recover data from a floppy disk, which is not readable by OS. Format 3.5" disk for 1.7 Mb size Also the disk includes full set of external DOS commands, console versions of the most popular archivers/compressors. Moreover, emergency boot CD includes minimal Linux distribution (Rescue Linux distribution) which may be very useful to a professional user. ~ Good Link Site for Microsoft, IBM and other Bootdisks. ~ Here you'll find drivers with setup programs to let you boot from a USB CD-ROM Unit. Ensure you have a blank formatted floppy disk available. Although the disk shouldn't strictly need to be formatted or blank, problems have been recorded where using disks that weren't. If running Windows 9x, click the Start button then click Run. In the Open box, enter "COMMAND.COM" then click OK.
Takeaway: You can't boot Windows XP from a floppy disk the way you used to be able to with DOS. One handy way to easily boot XP is by using a USB flash drive. Here's how to make it work. Almost everyone who has worked with computers for any length of time at all has run into at least one situation in which a problem left a PC unbootable. What if you could return the machine to a bootable state just by inserting a USB flash drive though? Believe it or not, it is actually possible to install a bootable copy of Windows XP onto a flash drive and then boot a PC off of the flash drive. From there, you can use applications that you have installed on the flash drive (anti virus, anti spyware, disk repair, etc.) to fix the PC's problem. In this article, I will show you how. As with most cool new techniques, there are a few catches. For starters, not every PC is capable of booting from a USB flash drive. For the most part, computers manufactured within the last two years are generally able to boot from a flash drive. Older systems may require a BIOS update, or might not be able to boot from a flash drive at all. Another catch is that not every flash drive will get the job done. The primary factors that limit your use of a particular flash drive are capacity and speed. Technically, speed isn't really a limiting factor, but booting Windows will be painfully slow unless you use a flash drive that supports USB 2.0. The flash drive's capacity is actually a limiting factor though. Surprisingly though, there are size limits on both the upper and lower end. Your flash drive can't be too large or too small. There isn't really a documented minimal size for a flash drive. You just need something large enough to hold Windows XP and a few applications. As you probably know, Windows XP normally consumes over a gigabyte of disk space. Later I will show you how to use a free utility to trim the excess fat off of Windows XP and make it a whole lot smaller. Even so, I still recommend that your flash drive be at least a minimum of 256 MB in size. As I mentioned, there is a maximum size for the USB flash drive that you can use. Currently, USB flash drives exist in sizes of up to 4 GB, and 8 GB flash drives are expected to be available by the end of the year. As nice as it would be to have 8 GB to play with, the flash drive that you use for this project can be no larger than 2 GB. The reason for this is because you will have to format the flash drive using the FAT-16 file system, which has a 2 GB limit. Presently, you are stuck using FAT-16 because most computers will not recognize a flash drive as being bootable if the drive is formatted with anything other than FAT-16. One of the requirements for creating our bootable USB flash drive is a Windows XP with Service Pack 2 installation CD. If your Windows XP installation CD doesn't already include Service Pack 2, then you will have to make a CD that includes Service Pack 2 through a technique called slipstreaming. Another utility that you are going to need is Bart's Preinstalled Environment Bootable Live Windows CD / DVD, or BartPE for short. You can download this utility for free. Get It. PEBuilder web site. In addition to the software requirements, you must verify that the PC that you will be using to create the Windows deployment has 1.5 GB of free hard disk space (minimum) and supports booting from a USB device. I also strongly recommend that the PC be running Windows XP Service Pack 2. Prior to Service Pack 2, Windows XP sometimes had trouble interacting with USB storage devices. Now that you have all of the prerequisites taken care of, it's time to actually start setting up our flash drive. The first step in doing so, as strange as it sounds, is to format the flash drive. Windows will actually let you format a flash drive in the same way that you format a floppy disk. However, formatting a flash drive in this way will not work for this project. Furthermore, using Windows to format a flash drive directly has been known to destroy some types of flash drives. Instead, you must format the flash drive by using the HP USB Disk Storage Format Tool that you downloaded earlier. To do so, simply open the utility, select the device followed by the FAT file system option and click Start. Once the device has been formatted, you must make it bootable. To do so, you must copy the BOOT.INI, NTLDR, and NTDETECT from the root directory of your PC's boot drive to the flash drive. These files are hidden by default, so you will either have to configure Windows Explorer to show hidden files (including protected operating system files) or you will have to open a Command Prompt window and use the COPY command to copy the files. If you choose to use the Windows Explorer method, then open Internet Explorer and enter C: into the address bar so that you are looking at your local hard drive. Next, select the Folder Options command from the Tools menu. When the Folder Options properties sheet opens, select the View tab. Now, just select the Show Hidden Files and Folders and deselect the Hide Extensions for Known File Types and the Hide Protected Operating System Files check boxes. Click OK to continue. Now that you have formatted your USB flash drive and installed the boot files onto it, the next thing that you must do is to configure your PC to allow you to boot from the flash drive. This is all done through the computer's BIOS Setup. I can't give you specific instructions for this part, because every computer is different. I can give you a few pointers though. You can access your computer's BIOS by pressing a specific key immediately after you turn the PC on. The key varies, but it is usually either [F1], [F2], or [Delete]. Once you are in the BIOS Setup, you should verify that all of your computer's USB options are enabled. This might include things like support for legacy USB devices or support for USB 2.0. If there is a time out setting for USB devices, you should set it to the max to insure that the system doesn't time out while waiting on the USB device to boot. Next, find the section on boot device priority. Normally, a USB flash drive (which is usually listed as USB-HDD, but may be listed as a removable device) will have a very low boot priority. If the USB flash drive's boot priority is lower than the hard disk (listed as HDD) then the only time the computer would ever boot off of the USB flash drive is if the system were to fail to boot from the hard disk. You must therefore rearrange the boot device priority so that the flash drive has a higher priority than the hard drive. Now that we have finally made it through all of the prep work, it's time to start setting up Windows. As you have probably already guessed, the process of installing Windows to a flash drive is quite a bit different from your normal, run of the mill installation. There are a couple of reasons for this. For starters, a full blown Windows XP deployment takes up over a Gigabyte of hard disk space. When you are installing to a flash drive, disk space is a scarce commodity. Even if you have over a Gigabyte of space on your flash drive, you probably don't want to use it all on Windows. It would be nice to have room to install a few applications. Therefore, you need to trim the excess fat off of Windows. The other reason why the installation process is so different from the usual Windows installation is because Windows Setup is not designed to install Windows to a flash drive. You therefore have to configure Windows using an alternate method. The PEBuilder utility that you downloaded earlier can take care of both of these issues. PEBuilder is designed to create a build of Windows XP (or Windows Server 2003) that does not take up as much space as a full blown installation. Once you create this new build, you can copy it to the flash drive. For right now, I will show you how to create a basic Windows build and copy it to the memory stick. Unfortunately, it's rather difficult to install applications once Windows is up and running. Therefore, after I show you how to create a basic Windows build, I will show you how to create a build that includes some applications. Begin the process by opening PEBuilder. When you open PEBuilder, you will see a screen similar to the one that's shown in Figure A. Simply enter the path to the Windows installation files (the ones from your Windows XP with Service Pack 2 installation CD). Next, verify that the Create ISO Image and the Burn to CD check boxes are not selected and then click the Build button. PEBuilder will now create the new Windows build. You must use PEBuilder to create a Windows build that will work with a flash drive. Now, it's time to copy Windows to the flash drive. To do so, you will have to use a special batch file that's included with PEBuilder. Open a Command Prompt window and navigate to c:\pebuilder313\plugin\peinst. 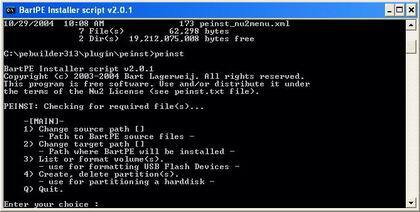 Now, insert an empty flash drive into the computer's USB port and then execute the file PEINST.CMD. 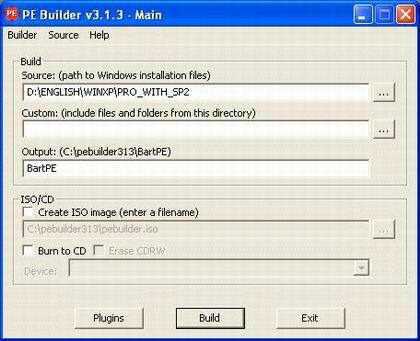 You will now see a menu appear as shown in Figure B.
PEBuilder uses a batch file to install Windows onto a flash drive. Type 1 and press [Enter] and you will be prompted to enter the path to the build that you have created. Enter C:\pebuilder313\BartPE. Now, type 2, press [Enter], and you will be prompted for the target path. Enter the drive letter that Windows has assigned to your USB flash drive. After doing so, the menu is updated as shown in Figure C. The menu now displays the source path and the destination drive. Type 5 and press [Enter] to install Windows to the flash drive. Use menu option 5 to install Windows to the flash drive. Now that I have shown you how to create and install a basic Windows build, I want to talk for a moment about how you can add an application to the build (prior to creating it). The PEBuilder program comes pre-configured to support a number of common Windows applications, but does not come with the applications themselves. The reason why installing applications can be a little bit tricky is because most Windows applications modify the Windows registry. The build that you are creating is basically a collection of installation files, and the build itself does not contain a registry (the registry gets created when Windows is installed onto the flash drive). As such, PEBuilder uses a sort of registry emulator. If you go to the C:\PEBUILDER313\PLUGIN folder, you will see sub folders for a number of different applications. If you open one of these application folders, you will see that the folder contains an INF file and a FILES folder. The INF file contains all of the information that would normally go into the registry, and the FILES folder stores all of the program's files. To see how this works, let's install an application that I'm sure most of you are familiar with; Nero. Begin by installing Nero onto the machine that's running PEBuilder, as if you planned to run Nero locally on that machine. When the installation completes, copy all of the files from C:\Program Files\ahead\Nero to C:\pebuilder313\plugin\nero burning rom\files. In this particular case, the nero burning rom folder is the folder that has been set aside for the Nero application. 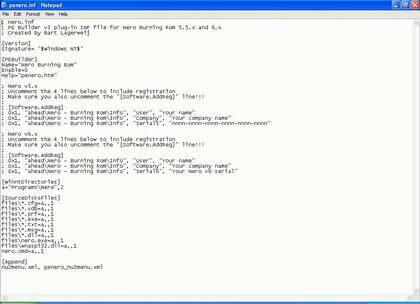 The Files sub folder is intended to store Nero's system files. Now, you must take care of Nero's registry entries. To do so, go to the C:\pebuilder313\plugin\nero burning rom folder and open the PENERO.INF file using Notepad. As I explained earlier, the INF file in an application's folder is used to store the application's registry entries. For Nero and all of the other applications that PEBuilder predefines, the INF file is pre-configured. You just have to make a few changes that are specific to your system. In this particular case, the PENERO.INF file is designed to support both Nero versions 5.x and 6.x. Initially, the lines for both versions are commented out. You must therefore determine which version you have and then remove the semi colon from the beginning of the lines that apply to that version. If you look at Figure D, you can see how the two versions are separated. An application's registry entries are stored in an INF file. Once you uncomment the appropriate lines, just replace "Your Name", "Your Company Name" and "Your Serial Number" with your name, your company's name, and your Nero product key. Save the file, and your set to go. The next time that you click the Build button, Nero will be included in the build. Running Windows from a flash drive isn't an exact science. Sometimes the process just doesn't work and there is no good reason why. As more PCs start to support booting from USB devices though, USB boots should become more standardized, and the technique should become more reliable.